Captain Orr returned to south western Pennsylvania from his captivity at Montreal whither he had been sent for exchange after his capture with others taken at the massacre of Lochry's party in 1781. In the summer of 1783 he raised another company for the defense of the frontier to serve two months. He marched them to the mouth of Bull creek, northwest of the Allegheny river, built a blockhouse there, and served out the necessary term. 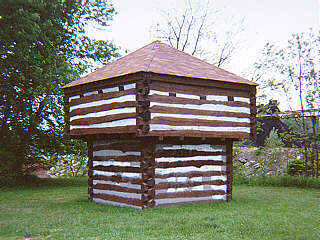 The replica pictured above stands at the mouth of Bull Creek. A plaque in Tarentum's Riverview Park (approximetly a quarter mile north) also commerates Orr's blockhouse.